Do you want your trip to be a cultural experience where you discover the most beautiful museums in Paris, its must-see attractions, as well as lesser-known sites that are equally worth visiting? PARISCityVISION, specializes in guided tours of Paris and invites you to discover its map of the most beautiful museums in Paris, which can be downloaded free online. Many apps allow you to access a map of Paris or an online guidebook. But most of them require an internet connection in order to work. By downloading our map of Paris museums in advance on your mobile phone or tablet, you can consult it whenever and wherever you want: in the subway, inside or outside, regardless of whether or not you have a 3G or 4G Wi-Fi connection. Many apps allow you to access a map of Paris or an online guidebook. But most of them require an internet connection in order to work. By downloading our map of Paris museums in advance on your mobile phone or tablet, you can consult it whenever and wherever you want: in the subway, inside or outside, regardless of whether or not you have a 3G or 4G Wi-Fi connection. 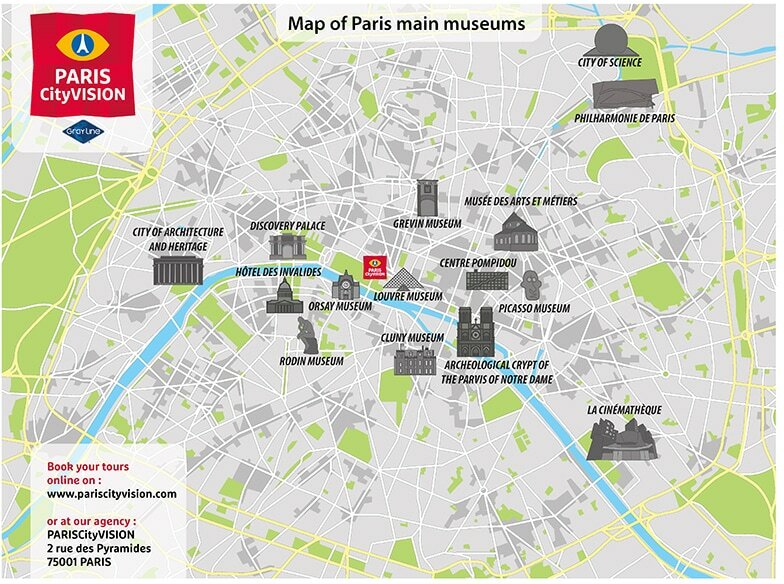 Our map of Paris museums can be downloaded free. It can also be easily printed: slip it into your pocket and add notes to better organize your visit. We have chosen some of the most beautiful buildings in the capital for you. On our map you will find the most magnificent and prestigious museums, like the Louvre, the Orsay Museum, Les Invalides, La Cité des Sciences, and the Centre Pompidou. Other iconic Parisian buildings like the Grévin, Rodin and Picasso museums are also indicated. For these museums, we recommend guided tours and/or admission tickets that you can order online. On this map, we have also chosen to show equally famous sites like the Quai Branly – Jacques Chirac museum, as well as other lesser known-ones, like the Cluny Museum of the Middle Ages, or the museum dedicated to music at the Philharmonie of Paris. And let’s not forget the Palais de la Découverte or the Archeological Crypt of the Parvis Notre Dame. You can visit all of these museums with the Paris Pass, which is sold on our site.